Cheesy Green Chili Mini Corn Dog Muffins are an easy and delicious kid friendly recipe with a twist, perfect for a snack, lunch or even brunch! These fun little bites are perfect for children or adults who want a healthier version of the classic. Spray two large mini muffin tins with non-stick spray (48 mini muffins in total). In a large bowl, combine the cornbread mix, eggs, green chiles, milk and salsa verde. Mix just until well combined. 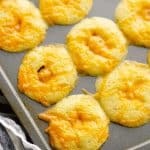 Scoop one heaping tablespoon of the cornbread mixture into each mini muffin tin. Top with a half of a cocktail sausage and a pinch of shredded cheese. Bake at 350° for 16-18 minutes minutes, or until the cornbread is set. Serve immediately with salsa or ketchup.